Appliances: Tenants need their own washer/dryer. Owner provides a refrigerator. Gorgeous single story home that has been upgraded throughout situated in a great neighborhood! 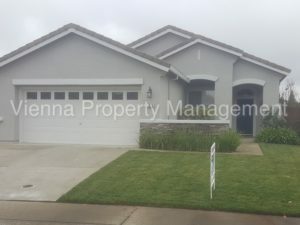 This home has a great open floor plan, brand new upgraded wood laminate flooring, new paint, new carpet in the bedrooms and. upgraded light fixtures. The spacious kitchen has tile counters, lots of cabinet space and a stainless steel oven, dishwasher and microwave. The kitchen opens up to the cozy family room with raised ceilings, ceiling fan, gas fireplace and views of the backyard.